In this section we will have a look at raid 01. This level is also known as raid 0+1 or Mirrored stripes. This is actually a combination of raid 0 and raid 1. The disks are striped and then mirrored. Remember that raid 0 only gives performance and no redundancy. It also gives us bigger luns or disks that are presented to the hosts. 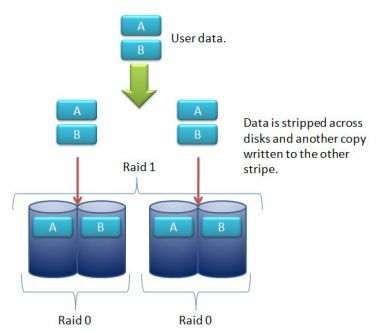 Raid 1 gives us redundancy by mirroring 2 disks together. With raid 0+1, we make use of striping and mirroring. Below is a picture of this level. As you can see in this configuration, two disks are striped and then the two stripes are mirrored. This level gives great performance with level 1 redundancy. 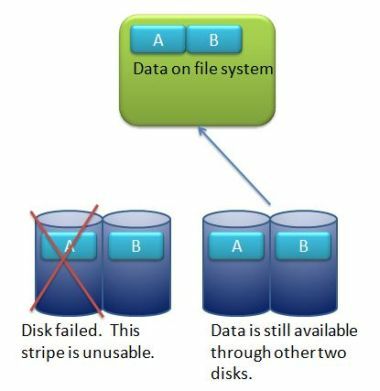 They one downside about raid 0+1 is the fact that if you lose a disk, the while stripe becomes unavailable and everything then runs of the other stripe that is mirrored. If you loose another disk, then you loose the volume. This can be avoided by using hot spare disks. A hot spare is like a spare wheel you carry around in your car. If you have a flat, then you use your spare and your are good to go. The same applies with hot spares. If you loose a disk, then the hot spare kicks in automatically and substitutes the broken disk with the hot spare. When you replace the failed disk, the hot spare can be made available again. Just like with your cars spare tyre. On most raid systems you can assign more than one hot spare. It all depends on the hardware and software you use. Raid 01 is available on hardware and software raid systems. Great performance. Because the disks are striped. You can use more disks to give you even better performance. Good redundancy. If you loose a disk then the other side of the mirror will continue to present your storage to the application. This redundancy could be enhanced with hot spares. Expensive. You need double the disks to implement this level. This could make using this level very expensive.